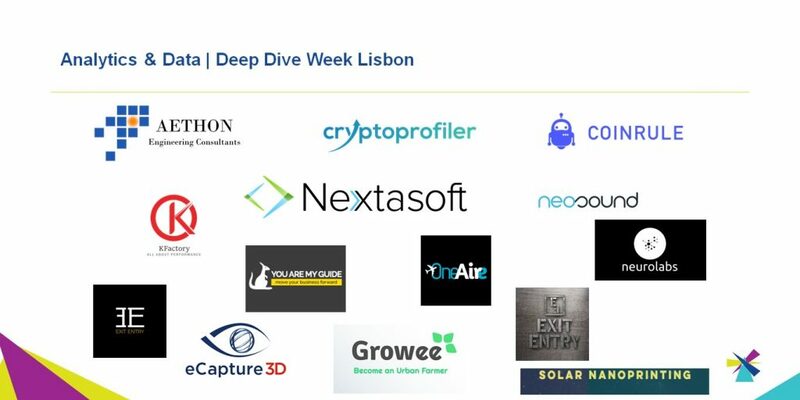 As Deep Dive Week Lisbon is approaching, we are glad to announce our 14 winners. The number of applications exceeded our expectations and after a thorough selection process, we are now able to confirm startups coming from Greece, Germany, Romania, Estonia, Ireland, Switzerland, Italy, Spain, while the applications were coming from all over Europe and beyond! We would like to thank everyone for applying. If you are not among the lucky ones, you can wait a bit longer, DDWs for 2019 will be announced soon. Stay tuned and spread the word! NanoPrinter for solar cells & Optics | Printer with focused nano-drops and deep learning via sensors for digital recognition – decrease mistakes for nano-printing perovskite solar cells & concentrators. Popertee | is building a programmatic platform enabling brands to find target audiences for campaigns, book a space and measure the results of their campaign. Nextasoft Ltd | Projects analysis and development of cutting-edge digital technologies for start-ups, encouraging the making of new business in Europe. KFactory | provides unconventional ways to maximize productivity in manufacturing. It deep dives into a 360* performance analysis and predict where problems can occurs, before causing losses. OneAire | Our mission is to modernize the highly inefficient procurement process within aviation aftermarket parts ecosystem using Deep Data Analytics (DDA) supported on SaaS platform. Exit Entry | showcases and measures the soft skills of college students and connects them with Multinationals and corporations for employment opportunities.We match students skills with job skills. Neurolabs | We use state of the art data science models to provide sales predictions for retail chains, helping them better stock their stores. This helps them reduce waste and saves them both money and prestige. Cryptoprofiler | We are helping banks and wealth managers to attract and understand the next generation of investors for financial products and cryptocurrencies by a gamified profiling solution with behavioral insight. NeoSound OU | enables machines to comprehend human emotions – a sound analytics solution for the call centers to improve the service. Coinrule | Trade While You Sleep. Coinrule is a beginner-friendly platform to send automated trading instructions to your favourite exchanges. No coding required. AETHON Engineering Consultants | aims to be a leader in behavioral analytics. Our product is data assimilation model that incorporates user feedback to enrich existing data sets to improve the quality of services of PTOs. You Are My Guide | GhostWriterAI, by You Are My Guide, is the first Italian Content Marketing Strategy Platform based on Artificial Intelligence. We put AI at work to bring you ahead of your competition. eCapture 3D | eCapture3D is a startup focused in cloud-based generation of 3D content, with photos taken with any kind of device, like a smartphone, without the need of prior knowledge of 3D content generation. Growee | Growing plants is complicated as it requires time, knowledge and effort. Growee, Grow what you love in a click through a smartphone from anywhere and enjoy organic crop that grows twice as fast. One of the aims of the forthcoming Data and Analytics Deep Dive Week in Lisbon, is to equip you with everything you need to scale up your business into Lisbon. We are therefore delighted to confirm that SRS Advogados will be on hand to guide you through all the legal procedures, as well as advice on financing the move. SRS have launched Portugal’s first ever accelerator that has been developed with the Law Society. You could not be in better hands. As part of the week we’ll be meeting with Startup Lisboa, Lisbon’s biggest accelerator. They have been commissioned by the mayor to redevelop the Beato area of the city, and you’ll get a sneak peak at what’s happening. Hub Criativo Beato will bring together the most innovative and exciting startups in Lisbon, with everything you need to ensure you’re set up to thrive. We’ll be having an app, which as well as having useful information like the programme and the locations, you’ll be able to use to search for other attendees. Want to have a meeting with somebody? Just drop them a message. We’ll be making some recommendations as well, to make sure that nobody misses out on what could be a great recommendation. The last event of the week will be a great place to meet your next investor. As well as bringing together everybody that has been involved in the Deep Dive Week, we’ll have a number of VC investors from across Europe. It promises to be a great networking opportunity! As we will share with you all about #DDWLisbon on social media. Until then, congratulations to the winning team of startups!